DUBLIN, IRELAND --(Marketwired - April 05, 2016) - Research and Markets has announced the addition of the "Combination Inhalers for Upper Airway Diseases" report to their offering. 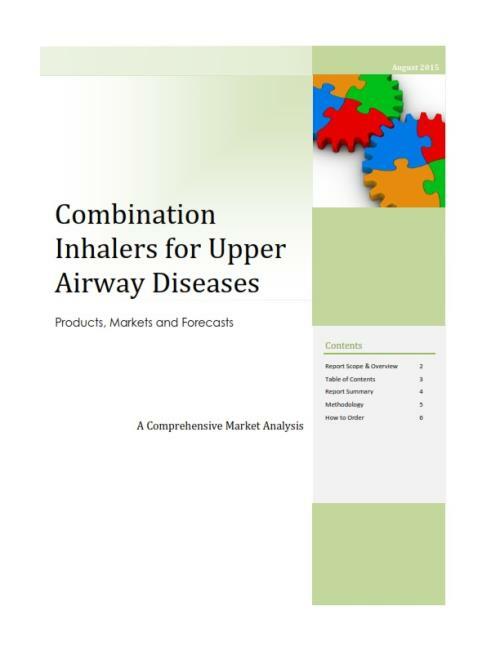 Combination inhalers for upper airway diseases -- oral inhalers containing two drugs that complement the therapeutic actions of one another -- have seen a significant increase in development activity and product proliferation in the past five years. Growth is being driven by improved patient experience as derived from ease-of use (fewer devices/medications to administer) and for many patients improved control of symptoms associated with upper airway diseases. Combination inhalers most commonly consist of an inhaled corticosteroid in combination with a bronchodilator. These products are realizing significant commercial success in the two markets for which they are indicated -- Asthma and COPD -- both of which are forecast to grow at impressive rates for the remainder of the decade.